This isn’t Spot, either. At least not the new Spot. 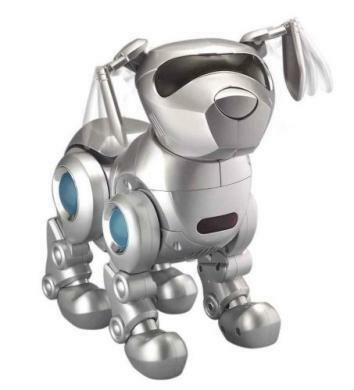 Boston Dynamics’ BigDog robot is pretty familiar at this point, but this is its smaller cousin. Spot weighs 160 pounds, while BigDog weighs in at 240 pounds. Spot is pretty light on its feet, can jog at a human pace, can slip and slide on ice or uneven terrain without falling down, and can even remain standing after being kicked. Kicking the robots is part of testing them! Spot is an indoor-outdoor pet. It uses electric power and hydraulics to move, and has a sensor head for things like navigation and balance. Spot doesn’t seem like as much of a workhorse (dog) as BigDog, but the more nimble robotic canine is probably intended for scenarios like emergency operations instead of carrying stuff. Spot (presumably) comes already housebroken, but at least for now, it could still probably cause a little damage around the house.